As the popularity of yoga continues to grow, it seems that there is a never-ending supply of new and cool workout props. This means that your workout routine never has to become boring or dull. There is always something new to try. 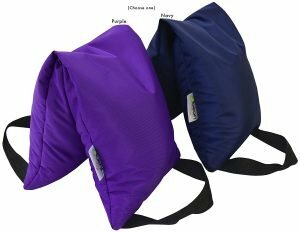 Bean Products has brought us the 10 lb Yoga Sand Bag. This handcrafted bag is available in two different colors and arrives prefilled with ten pounds of sand. Created with sturdy nylon, the bag is easy to wipe off and keep clean. There are also two handles (one on each side) that are convenient for carrying the bag. To say that this product is versatile is truly an understatement. It has so many different uses, making it an item that you will use again and again. As a yoga prop, it can be used in multiple ways. First off, the added weight that it provides when used allows for deeper postures by increasing the tension when stretching. Body toning and resistance exercise are also enhanced due to the added weight. The value of the sandbag is not only limited to enhancing your yoga routine. It is equally useful when doing Pilates, P90X bodyweight workouts, etc. It’s a good idea to experiment with it because without a doubt you will find it beneficial to use when doing other types of exercises. Many people are not aware of the calming benefits that using weighted props provide. The added weight stimulates what is known as the deep pressure touch receptors which are found within our bodies. When this occurs, feelings of enhanced relaxation take place. People who work with weighted props and are afflicted with ailments such as insomnia, autism, depression, stress, anxiety, Alzheimer’s, Parkinson’s disease and pain have reported a reduction in their symptoms. Considering all of the benefits that they offer, these sandbags are a smart addition to anyone’s workout. And because you are going to work out anyway, using the weighted bags won’t require any additional time to put them to use.